a Red Pumpkin Studio: Fabric for Sale! This afternoon I was very excited to have a couple packages and a postcard in my mailbox! 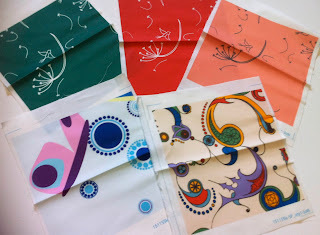 One of the packages had the samples I ordered from Spoonflower a few weeks ago. I'm happy with how all the designs turned out, especially the coloured steampunk pattern. I'm going to make bookcloth out of them to make some cute little books with. I know you've been dying to buy your own, and they're now available in my shop! Go check it out! Fabric Design - Go Vote!